The U.S. Attorney's office in Washington Thursday appeared to back off its claim that a suspect said to be social media friends with Pittsburgh synagogue shooting suspect Robert Bowers stated online that the massacre "was just a dry run for things to come." But federal prosecutors still want Jeffrey R. Clark behind bars. 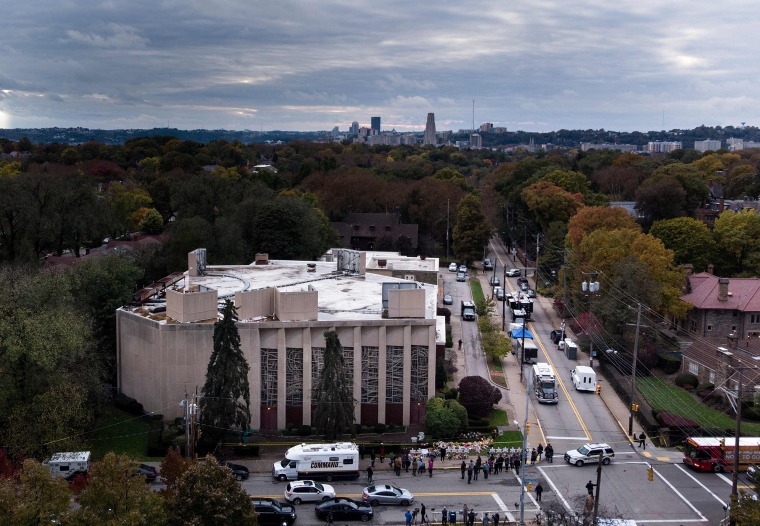 The clarification came in a pretrial detention memo filed after an NBC News analysis published Wednesday revealed that Clark posed that statement Oct. 26 — a day before the synagogue attack in Pittsburgh. The post rather was likely referring to the pipe bombs that were mailed to various high-profile critics of the Trump administration, the FBI filing indicated. Clark, 30, was charged on Nov. 9 with transportation of a firearm across state lines and possession of illegal, high capacity magazines intended for use with AR-15 weapons after a search of his residence in Washington, D.C., turned up the items, according to an FBI affidavit. The suspect lives with his father and sister, and the bureau described him as a neo-Nazi who praised Bowers as a "hero." Bowers has pleaded not guilty to federal hate crime charges. The FBI said Clark posted on conservative social media site Gab that the synagogue victims "deserved exactly what happened to them and so much worse." His Gab account has since been deleted. But the Thursday court filing by the U.S. Attorney's Office appeared to acknowledge that the "dry run" remark was a response to the Oct. 26 arrest of Cesar Sayoc, who is alleged to have mailed pipe bombs to several critics of President Donald Trump. In fact, the filing states that the remark was posted "on or about October 26," a day before the synagogue tragedy. Still, the U.S. attorney argued, "The court should not view this statement as simple hyperbole." Prosecutors also said that the FBI's interpretation of an image posted to Clark's account Oct. 26 was "incorrect." The FBI affidavit described it as "a picture of Robert Bowers, armed with a gun, splattered in what appears to be blood." But NBC News discovered it's actually a known alt-right meme. The FBI said in its original affidavit that that "dry run" statement "implies that Jeffery Clark did know more about the attack in the Tree-of-Life synagogue, and that there was more to come." The NBC News analysis could not verify that Clark ever posted that Bowers was a hero or that the victims deserved their fate. But it did appear, in fact, that he and Bowers followed each other on Gab — without any known interaction. The U.S. Attorney's Office in Washington had no comment. A public defender listed as representing Clark did not respond to NBC News' inquiries.